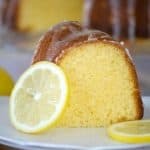 This Easy Lemon Cake is simple to make with a box cake mix, lemon gelatin, and Kroger Simple Truth Eggs (Cage Free). This will be a special dessert served at Easter, Mother’s Day or all year ’round. The very first time I tasted this Easy Lemon Cake, I fell in love with it. It was hand delivered when Kurt’s mom and dad drove out to Illinois after we’d had our first baby. Gigi, the matriarch of my mother-in-law’s family has baked it to welcome her new great granddaughter. Granted our daughter didn’t have the opportunity to enjoy it then, but she was able to do so for years to come at many Easter celebrations. 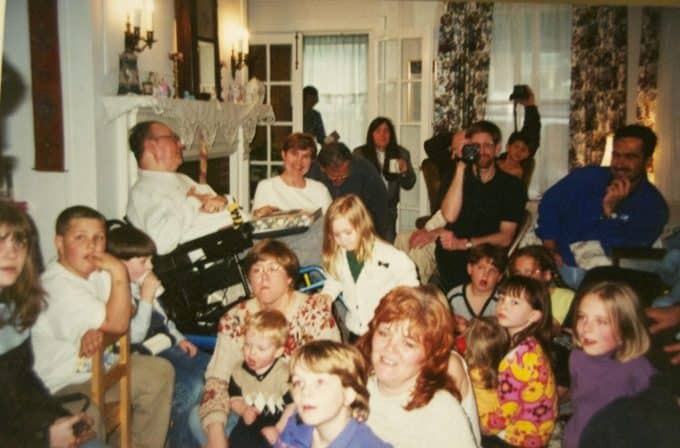 Every year Gigi’s four children and their families from across the country would gather together to celebrate both Easter and her birthday the same weekend. Not everyone was able to attend at times, but those gatherings were something special. We created many memories to last a lifetime and built stronger family relationships all because Gigi and Granddad created a strong foundation on which to do so. This Easy Lemon Cake is moist and full of lemon flavor. You could even add bit more by adding a 1/2 – 1 teaspoon of lemon extract if you’d like. A plain cake mix usually calls for 3 eggs, but for this recipe I used 4 of Kroger’s Simple Truth Eggs. I love shopping at my local Fry’s Market (Kroger) because I love the atmosphere and layout of the store, but even better they’ve recently dropped the prices on many items including the eggs! 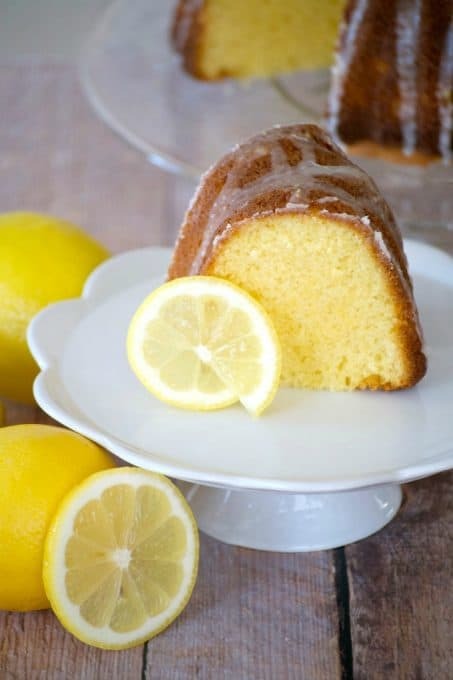 To make this Easy Lemon Cake I used this bundt pan, this lemon juicer, and these spatulas. 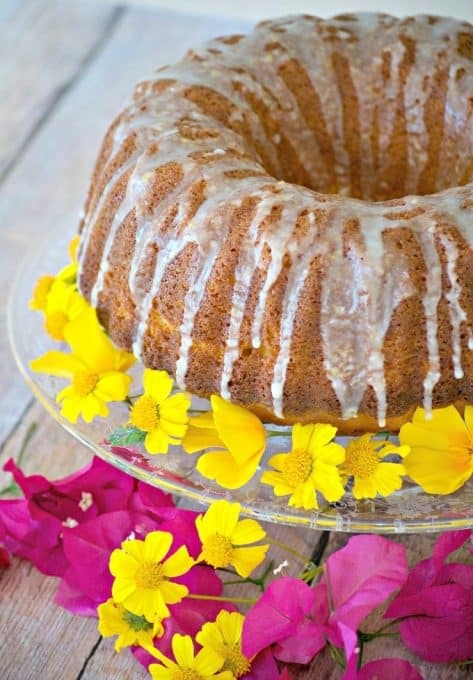 This Easy Lemon Cake is made with a cake mix, lemon gelatin, and Kroger Simple Truth Eggs. A special dessert served at Easter, Mother's Day or year round. Prepare a 12-cup bundt pan by spraying it with a floured baking spray or by misting it with cooking spray and dusting it with flour. Shake out excess. Place the cake mix, lemon gelatin, eggs, canola oil and water into a mixing bowl and beat on low for one minute. Scrape down the bottom and sides of the bowl. Beat for an additional two minutes on medium speed until thick and well-blended. Pour batter into prepared pan and gently tap pan on counter a couple times to even and remove any air bubbles. Bake for 40 minutes, until light brown and cake just begins to pull away from the sides of the pan. Place on wire rack to cool in pan for 10 minutes. In a medium bowl, whisk confectioners' sugar, lemon juice and lemon zest together until smooth. Gently remove cake from pan by placing a plate on the bottom and flipping right side up. Place the cake again onto wire rack and spoon the glaze over the cake so that it drizzles down the sides and into the middle. Store the cake covered in plastic wrap at room temperature for up to one week. Cake can also be frozen by wrapping in foil for up to 6 months. Thaw cake overnight on the counter before serving. Cakes are always the perfect dessert to serve for any holiday. 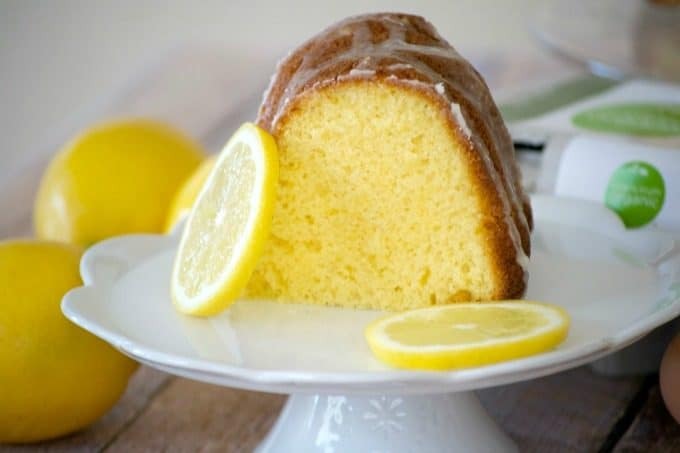 This Easy Lemon Cake will be perfect on your Easter dessert table or as a surprise for mom on Mother’s Day. If you’d rather serve a chocolate cake, you’ll want to check out this cake. This cake with strawberries is easy and will be a big hit as well. Or if you like citrus, this cake will surprise your guests when you cut into it! Take a look at videos to see some awesome cakes and how to frost one perfectly!